The Colts and Chargers match up on November 28, 2010 was one of the most anticipated in sports history, and Chargers fans weren't disappointed. Details of the game are included below, but let's first take a look at the profiles and achievements of these two stellar teams. The Colts are Indianapolis’ own professional American football team. They belong to the American Football Conference’s South Division in the National Football League or NFL. 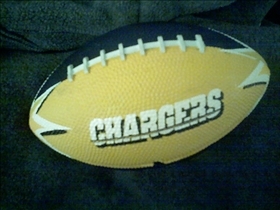 The Chargers play out of San Diego, and are the professional American football team of the city. They belong to the American Football Conference’s Western Division in the NFL. The team started out in 1960 as a member of the American Football League, and they played their first season in Los Angeles. It was in 1961 that the team moved to San Diego. Chargers home games today are played at Qualcomm Stadium. The Colts have won no less than three NFL championships (in 1958, 1959, 1968), and they won the 1971 Super Bowl as well. The team also won the Super Bowl XLI in 2007 after the move to Indianapolis. In addition, the Colts have won 12 games or more in five consecutive seasons since 1998, making it the first in league history to do so. The team won a further two seasons, extending its record to seven consecutive seasons of 12 wins or more. The Chargers on the other hand is the only team to have a season start of 0 - 4 and still make it to the playoffs, which it did in 1992. In 2008, the team started the season 4 – 8, and again managed to make the playoffs. The Chargers is also one in only 5 teams in the NFL that have ranked first in overall offense and defense in the same season since 1970. This accomplishment in 2010 made them the only team to have achieved that distinction without making the playoffs. The Chargers also won an AFL title in 1963, and managed to reach the AFL playoffs five times and the AFL Championship four times before signing on to the NFL in the AFL-NFL merger of 1970. The Chargers have since made it to the playoffs ten times, and played four AFC Championship games. On the November 28, 2010, in Indianapolis, the Chargers dominated the field with the help of Kevin Burnett’s and Eric Weddle’s interceptions that resulted in spectacular touchdowns for the team. At the end of the game at Lucas Oil Stadium, the San Diego Chargers beat the Indianapolis Colts, 36 – 14. Which team has better players?